The Preferred choice for those with large areas of carpet, a large capacity bags mean fewer stops for maintenance. NEW Vacuum and Fast Free Shipping via FedEx! Sanitaire by Electrolux commercial lightweight models, the SC679J Sanitaire Vacuum is UL listed for Commercial use and ideal for Office and hotel/motel use. This lightweight made for heavy-duty cleaning is the choice when tackling large areas of carpet in a short time. The 18 Quart Reusable High Capacity Shake Out Bag Upright offers a large capacity bag that minimizes stops and starts. The re-engineered, long-life motor is built to last. The SC679J is easy to maneuver, weighing just over 12 pounds. Plus, it's easy to use on any type of carpet with it's four position carpet height adjustment. A 12-inch cleaning width and 30-foot power cord combine to make the Sanitaire SC679 commercial upright convenient and powerful cleaning machines..
Sanitaire Promise of Performance One-Year Warranty which covers parts and labor. 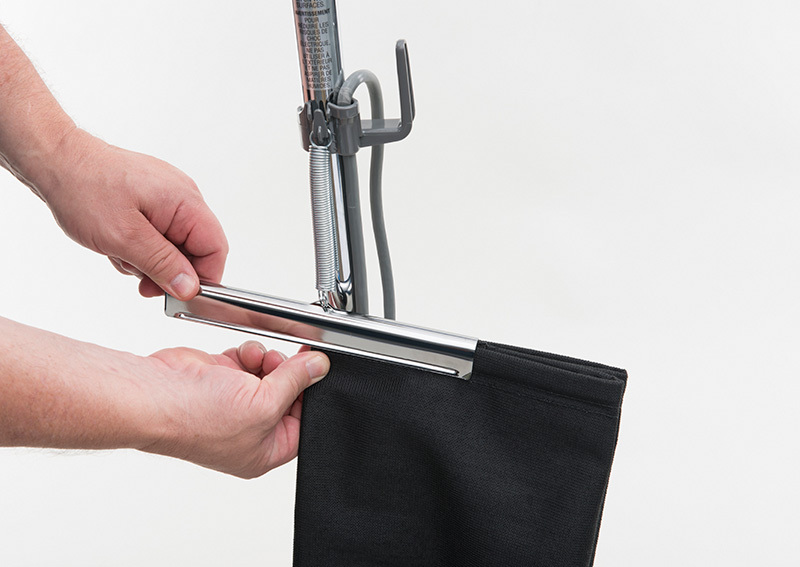 No disposable Dust Bags needed, the no-tools bag release system with easy to remove metal bag clip make emptying easy, saving money on disposable dust bags. Office mangers and hotel/motel managers know it's important to take care of the housekeeping staff because their handiwork is the first thing guests notice. Sanitaire has introduced new cleaning tools that offer top commercial cleaning performance while making vacuuming work less of a workout. The new Sanitaire Lightweights, models SC679 is lightweight, quiet and easy to empty, three features that every member of the cleaning crew can appreciate. The Sanitaire SC679J Lightweight is 5-amp upright cleaner with a Commercial UL listing. have a lower noise level than standard units. The clear bumper protects walls without leaving marks and the long life chrome steel handle and 30-foot, 3-wire cord last through the toughest use. Consider the Sanitaire SC679J Lightweight Upright, models SC679J when it's time to replace the cleaners in your fleet. This model have all the power, all the features and all the durability with less weight and less noise. Your cleaning crew will thank you. High capacity reusable bag uprights save money with the no-tools, bag release system. The metal bag clip is simple to remove and makes emptying easy. The front of the cleaner has an adjustment that raises or lowers the cleaners base to match the type of carpet. With the power cord unplugged, set the adjustment to the lowest setting for maximum cleaning. If the cleaner is difficult to push, move the adjustment to the next height setting until the cleaner is comfortable to push. The brushroll must reach the carpet for effective cleaning. Easy maintenance to the Belt and Brush roll, no tools needed. require a higher level of filtration? CRI Certification signifies a superior cleaning vacuum that has passed stringent testing for soil removal, dust containment and carpet appearance retention. Only Sanitaire sealed HEPA vacuums with their patented filtration system capture 99.97% of all particles down to 0.3 microns for cleaner indoor air. Even the carbon dust emitted by the motor is captured. Sanitaire sealed HEPA models give you the satisfaction that you are not only cleaning the carpet more efficiently, but also emitting only clean air back into the room. These documents are in Adobe Acrobat (PDF) format. You need Adobe Acrobat Reader to view and print these documents.